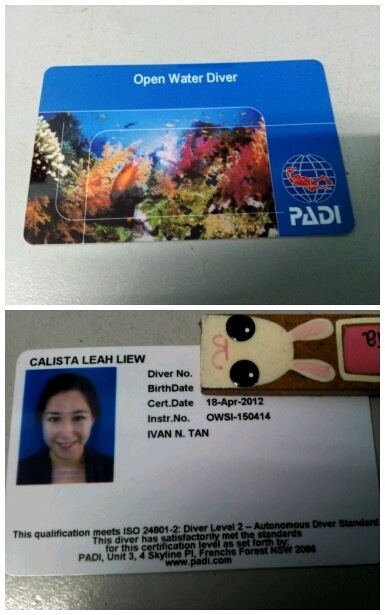 Calista Leah Liew: Officially a Certified Diver!! What made me decide to get the licence? Well, I've dived twice as a Discovery Diver before taking up the course, once in Sapi Island and once in the Phi-Phi Islands in Phuket, Thailand, and was instantly hooked by the serenity and beauty of the undersea world. It's like nothing you've ever experienced before, where all you can hear is the sound of your own breathing, and the feeling of gliding effortlessly through water, just like the colourful fish right next to you! 1st time diving at Sapi, and the view of the dive spot in Phuket. 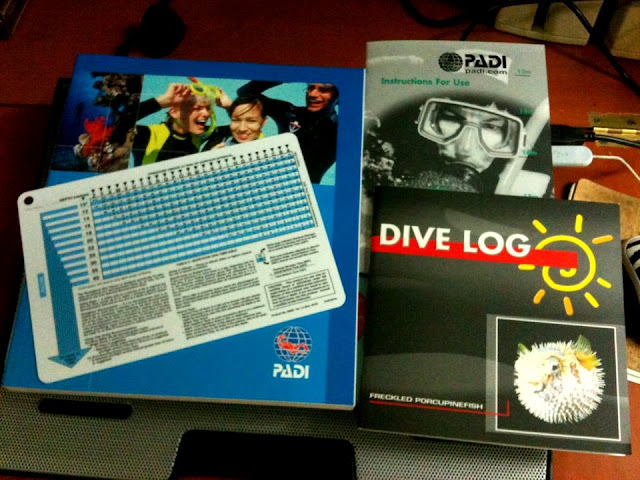 The Open Water Diver manual, dive log, dive table and its instructions. After you pass all the tests the instructor will give you (basically he will show you, and you just have to follow suit. They are mainly about getting you comfortable underwater, and familiar with your gear and all its uses. Exercises like removing your mask and regulator, ensuring you know the hand signals etc will be conducted. ), you will be taken on short dives where you can start wondering at the beauty of this other world! Sipadan, ranked no. 2 in the whole world as best diving spots, has been a dream for me, which is why I really wanna get my advanced licence within the year, so I can plan a trip there next year! There is a certain limit of divers allowed each day to dive on the island, but especially with an advanced licence, there are many more sites to visit nearby, such as the Mabul, Mataking and Kapalai islands to keep me busy while I wait for my turn! Examples of must-see dive sites at Sipadan are Barracuda Point, The Wall, and the Turtle Tomb Cave, which you can only explore with an Advanced licence! Wreck diving in Labuan.. Photo credits. Downbelow is one of the best choices if you wanna get your licence here in Sabah, and many tourists who are here to explore the beautiful waters do! Located in KK Times Square, which is right next to Sutera Harbour Resort, whose marina you will be departing from to their centre on Gaya Island (about a 10 minute speedboat ride), Downbelow is also a licenced PADI dive shop where you can buy your first dive gear. A pair of good fins are at the top of my list of gear to buy, but perhaps not as much as a fashion statement as these ones! Well I've done Discovery for just RM180 if you dive in Sapi, and I heard you can dive other places for rm250 - 350.. Advanced,not quite sure how much,maybe about RM1k..? =)But you have to do Open Water before Advanced.. Hihii..
Congratulation for becoming certified diver. This is my current list to do too but was busy travel around. Hopefully some day could be like you.